Today’s Find Of The Day celebrates many of our city’s finest monuments and buildings, and one of my summer favorites, iced cold beverages. 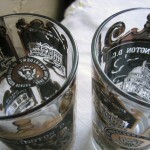 These vintage drinking glasses feature black and gold images of The White House, The Capital Building, Iwo Jima Memorial, Tomb of the Unknown Soldier and the Lincoln Memorial arranged around the seal of the POTUS. The unique and quite handsome set were made around 1950. On a Monday afternoon, all I can do is imagine both glasses filled with either some Jack Daniels and Ginger Ale, or perhaps a Gin Rickey. Heaven.